It is the day after Aimee Patterson’s high school graduation. College beckons, as does her dream of becoming an engineer. On an early evening walk, her cocker spaniel charges into the woods on the other side of the pond. Aimee trails after him, and in the stillness of that forest the unthinkable happens. She becomes paralyzed and watches in horror as her hands vanish before her eyes. 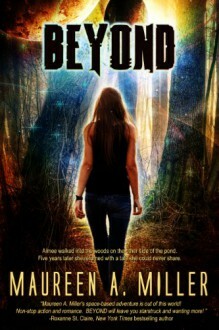 Waking to the sound of voices, Aimee realizes that she has been kidnapped. Little does she know how far away from home she is, though. In an attempt to flee her captors, she launches from their confines only to freeze at the view outside the window. The sky is black and filled with stars, and in the distance is a familiar blue globe. The planet Earth. A group of humans forced to flee their planet after an epidemic destroyed their civilization now travel the galaxies in search of an antidote. Retrieving samples of plant life from every solar system, on this occasion Aimee was accidentally seized instead. Aimee must learn to avoid the advances of an awkward young scientist who seems intent on dissecting her, as her own fascination turns to the exotic young warrior, Zak. Having fallen in love with Zak, she is now torn with the decision to return to Earth or live beyond the stars. It was okay at first and then it just fantastically bad and insta-love debacle like so I quit.